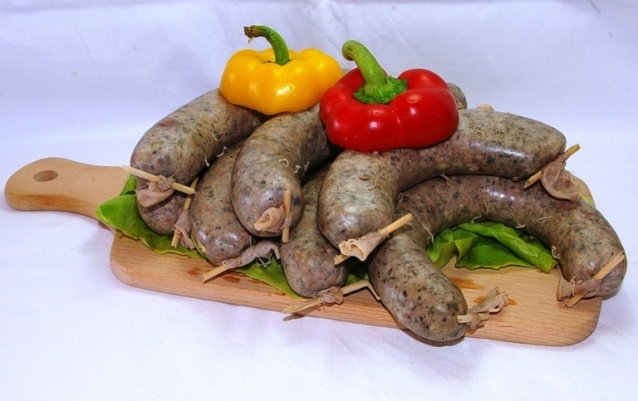 Jitrnice (liver sausage) are essential product of every pig slaughter and they are produced in all of Czech Republic. Depending on region, their preparation changes. In some parts of Moravia, people add semolina instead of buns. Boiled rice is also used and groit. During boiling we watch carefullly if the water is not boiling heavily – sausages could tear up. Boil brisket and jowl until semitender and lungs until tender. Cube buns. Grind boiled lungs and grind raw livers twice. Remove bones and cartilages from brisket and cube brisket and jowl. Put cubed buns in a bowl and pour part of broth, add livers, garlic, lungs and rest of broth. Salt and season and mix thoroughly. Then add meat from brisket and jowl and mix again. Season to taste if necessary. Cut thin casings to 20 cm (8 inch). Close one end of casing with skewer and fill with mixture. Then close the second end with skewer. Boil in hot water (90°C) for about 15-20 minutes. Wash boiled sausages in cold water and let cool of on wooden plate. Turn them after 15 minutes.